Make dinner easier with this Parmesan chicken and rice dish. 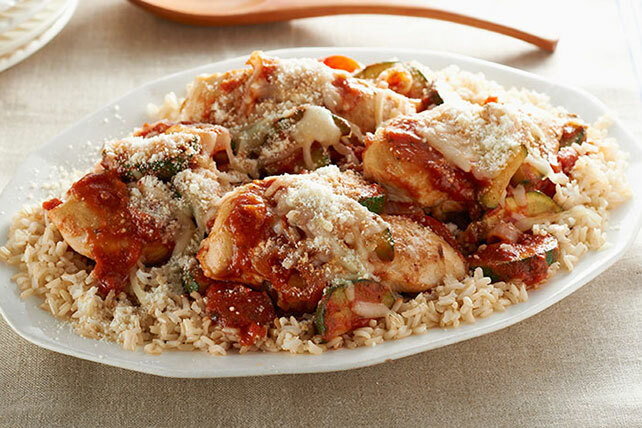 Rustic Parmesan Chicken and Rice features fresh veggies, tangy sauce and lots of cheese. Heat 2 Tbsp. dressing in large skillet on medium heat. Add chicken; cook 5 to 7 min. on each side or until done (165ºF). Remove chicken from skillet; cover to keep warm. Add remaining dressing and vegetables to skillet; cook 3 to 5 min. or until vegetables are crisp-tender, stirring frequently. Stir in pasta sauce; cook 1 min. or until heated through, stirring frequently. Spoon rice onto platter; top with chicken, sauce and cheeses. Sprinkle with 1/4 cup thinly sliced fresh basil just before serving.